When people think of bacteria, they usually think of germs—disease-causing agents that threaten human health. In reality, they make life on Earth possible. One group of bacteria—the cyanobacteria—has completely transformed Earth’s environment through their long history. Three billion years ago, ancestors of cyanobacteria infused Earth’s ancient atmosphere with the byproduct of their photosynthesis—oxygen—changing the chemistry of the planet and setting the stage for entirely new oxygen-breathing life forms to evolve. Without the cyanobacteria, the life we see around us, including humans, simply wouldn’t be here. Before 1970, cyanobacteria were known to occur widely in fresh water and terrestrial habitats, but they were thought to be relatively unimportant in the modern oceans. This perception changed dramatically in the late 1970s and 1980s with the discovery of photosynthetic picoplankton by scientists at the Woods Hole Oceanographic Institution and the Massachusetts Institute of Technology. Tiny members of this group of newly discovered cyanobacteria, Synechococcus and Prochlorococcus, turn out to be the most abundant organisms on the planet today. They are at the base of the ocean’s food chain, making air, light, and water into food for other life. Today, exploiting new biotechnological techniques, we are exploring their genes and uncovering the secrets of these extraordinary organisms. In 1977, I was on the Atlantis II in the Arabian Sea with WHOI microbiologist Stanley Watson, measuring bacterial abundance and biomass. We were using a new technique employing epifluorescence microscopy: Fluorescent dyes specifically labeled nucleic acids, making bacterial cells fluoresce green when excited with blue light. But, to our great surprise, some samples contained cells that glowed a brilliant orange—before any dye was added. The color was produced by the natural fluorescence of phycoerythrin, the primary light-harvesting pigment in many cyanobacteria. This was our first introduction to Synechococcus. To examine this new cyanobacterium, we attempted to culture it on that cruise, using media developed during my Ph.D. studies. But the cells died within 24 hours. It would take almost a year to develop media in which Synechococcus could successfully be isolated and grown in the laboratory. We knew right away that Synechococcus was something important by the impressive numbers of them that we found in seawater samples. Since 1977, they have been found everywhere in the world’s oceans when the water temperature is warmer than 5°C (41°F) at concentrations from a few cells to more than 500,000 cells per milliliter (about 1/5 of a teaspoon), depending on the season and nutrients. This amazing abundance makes them a source of food for microscopic protozoans, the next organisms up in a food chain that ends in fish and mammals. Bacteria take up the elements essential to life—especially carbon and nitrogen—and incorporate them into molecules that higher bacteria-consuming organisms use for growth. Bacteria also can reverse the transformation, returning elements to the environment, completing sequences of reactions known as nutrient cycles. Without the continuous cycling of these elements, all biochemical life processes would lead to a dead end. 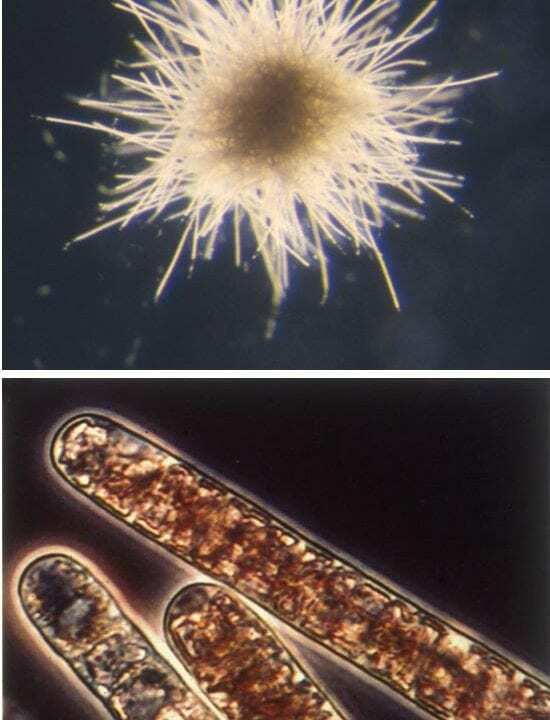 Cyanobacteria are vital to two primary nutrient cycles in the ocean. In the carbon cycle, they photosynthetically “fix” carbon from air into organic matter at the base of the food chain, simultaneously releasing oxygen. Many are also important in the nitrogen cycle—a complex series of reactions and transformations, including one known as nitrogen fixation, which converts nitrogen from air and incorporates it into cellular compounds. The key is cyanobacteria’s ability to use molecular nitrogen (N2, or dinitrogen) as a source of nitrogen for their cells. Cyanobacteria live anywhere there is light and moisture: in the open oceans, in pristine or polluted lakes and streams, in soils, hot and cold deserts, hot springs, brine pools, and salt ponds. In symbiotic relationships with algae and plants, they provide nitrogen to their hosts in exchange for a site to live on. In many instances, cyanobacteria are visible to the naked eye. In coastal oceans, cyanobacteria form dark blue-green mats covering rocks and mollusk shells in tidal pools. Along upper limestone shores, they form black crusts that erode rocks. In salt marshes throughout the world, several types of cyanobacteria play a key ecological role in binding sediments by forming dense layered mats. In the tropics, these mats, called stromatolites, become very thick; cyanobacteria inside them look almost indistinguishable from those in 3-billion-year-old fossil stromatolites. 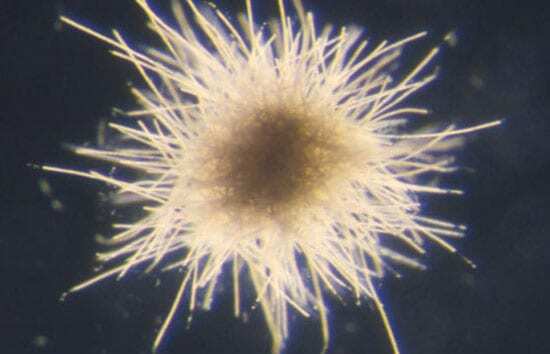 This is evidence that cyanobacteria inhabited the seas when the Earth was still young. Three billion years ago, Earth’s atmosphere contained little oxygen. But ancestral cyanobacteria thriving in the early oxygen-free oceans evolved a biochemical mechanism for photosynthesis, which used light to generate cellular energy by splitting water molecules, and producing oxygen in the process. For a billion years, growing and multiplying in the sea, they slowly raised the oxygen level in the atmosphere to 20 percent, the level that supports oxygen-breathing life. Cyanobacteria alone, directly or indirectly, are responsible for all of the oxygen in our air. In every case, the green plants we are most familiar with, from unicellular algae to trees, owe their photosynthetic abilities to small chlorophyll-containing bodies within their cells known as chloroplasts—which look a lot like cyanobacteria. In fact, most microbiologists believe that chloroplasts are derived from cyanobacteria—or, more precisely, that ancestral cyanobacteria entered larger cells and became symbiotic in them, making them photosynthetic, and creating plants. Both plants and cyanobacteria use carbon dioxide in air to synthesize cell carbon. But only bacteria can fix dinitrogen as a sole source of nitrogen in cells. Microbiologists believe this ancient process evolved very early, while Earth’s atmosphere was still without oxygen, because the necessary enzyme, nitrogenase, is inactivated by oxygen. Cyanobacteria have mechanisms that allow oxygen-producing photosynthesis and dinitrogen fixation—two antagonistic physiological processes—to coexist in the same organism. In some, the two processes are separated by time: Photosynthesis happens during daylight and dinitrogen fixation at night. In more complex species, the two processes are separated by space, with dinitrogen fixation occurring only in specialized cells (heterocysts) within filaments. 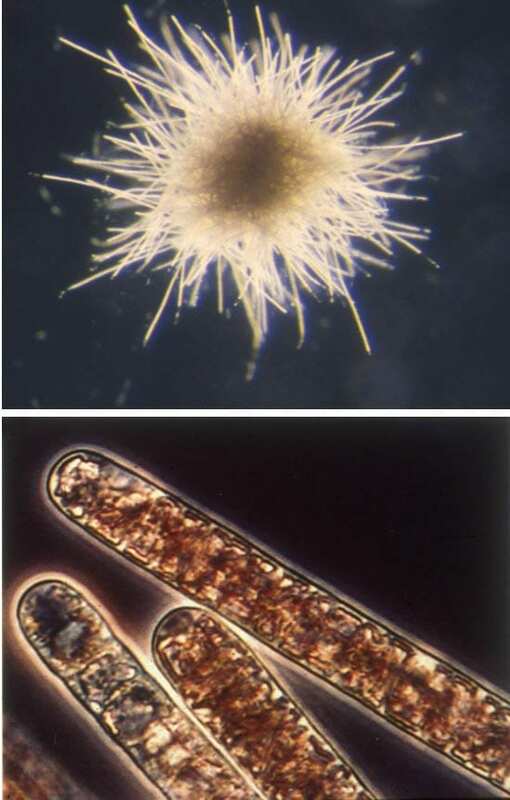 Trichodesmium, a filamentous cyanobacterium, plays an important ecological role by replenishing nitrogen in the central oceanic gyres—areas of widely circulating currents in the middle of oceans—where nutrients like nitrogen, required by other marine microorganisms for growth, would otherwise be low. In calm weather, their buoyant red-colored colonies rise to the surface, resulting in massive blooms that can cover thousands of square kilometers. These blooms gave the Red Sea its name. Trichodesmium quickly disintegrates when collected at sea and has been notoriously difficult to culture in the laboratory. In 1990, my lab at WHOI established conditions that made culturing routine and reliable by using very rigorous cleanliness. It turns out that instead of failing to add something these cyanobacteria required, we were inadvertently poisoning them with trace contaminants in our chemicals and on our glassware. We can now grow four of the five species of Trichodesmium in the lab and use molecular genetic methods to study them. (See The Deeps of Time in the Depths of the Ocean) In collaboration with the U.S. Department of Energy’s Joint Genome Institute, we have sequenced the entire genome of one Trichodesmium species. These advances give scientists at WHOI and elsewhere the ability to uncover the genetic reasons for Trichodesmium’s success. We can also culture Synechococcus, and using molecular methods, scientists have found 12 distinct groupings, or clades, of marine Synechococcus, each approximately equal to a species. Scientists at the DOE’s Joint Genome Institute have already sequenced the genome of one type, and others will soon follow. Scientists are examining the factors that control Synechococcus’s growth and distribution to understand more about their role in the ocean, especially in the food chain. Others are examining how Synechococcus coexists with a diverse and abundant group of cyanophages. Even as we studied Synechococcus, new surprises awaited. In 1985 Robert Olson of WHOI and Sallie Chisholm of MIT discovered a second group of even smaller photosynthetic picoplankton in the Sargasso Sea, in the central North Atlantic Ocean. Olson took to sea, for the first time, an instrument that could count bacterial cells using fluorescence, the Flow Cytometer. The instrument led to the discovery of cyanobacteria ranging in size from 0.7 to 1.0 micrometers called Prochlorococcus. It is our great fortune that these cyanobacteria can also be cultured in the lab. Scientists at MIT have assembled a collection of strains (cell lines) for Prochlorococcus collected from various places, while WHOI maintains collections for Synechococcus, Trichodesmium, and Crocosphaera, another recently discovered cyanobacterium. As a sort of lending library of cells, these two sites provide cultures for microbiologists all over the world to study. Oceanographers measuring Prochlorococcus at sea have found it to be staggeringly abundant in central oceanic gyres, where it can reach concentrations in excess of 100,000 cells in a milliliter of seawater. It may represent fully half the total photosynthetic production in these waters. Rough calculations, based on the surface area of the oceans and the abundance and distribution of Synechococcus and Prochlorococcus, suggest that these are the two most abundant organisms on Planet Earth. Discoveries about cyanobacteria continue. We recently isolated Crocosphaera, a new genus of dinitrogen-fixing cyanobacteria, from the tropical Atlantic and Pacific Oceans. Surprisingly these 2-to-4-micrometer cells, which might otherwise occur in vast areas of the ocean, are relegated to the tropics by a quirk in their physiology: They cannot grow at temperatures colder than 24°C (75°F)! Scientists have also found Richelia, cyanobacteria with specialized cells for fixing dinitrogen that live inside single-celled marine plants, including some diatoms. (See Revealing the Ocean’s Invisible Abundance) With Richelia fixing dinitrogen for them, the diatoms form extensive blooms. Such symbiotic relationships between phytoplankton and dinitrogen-fixing cyanobacteria, once they can be successfully cultured, may be shown to play a significant role in the carbon and nitrogen cycles of the oceans. Clearly, cyanobacteria, which have been so central to life on Earth, will continue to provide many new surprises, as scientists learn more about them as they explore the world’s oceans. Many biological compounds, including photosynthetic pigments such as the chlorophylls and phycobiliproteins, fluoresce naturally when excited with light. This natural fluorescence played a key role in the discovery of the marine photosynthetic picoplankton. 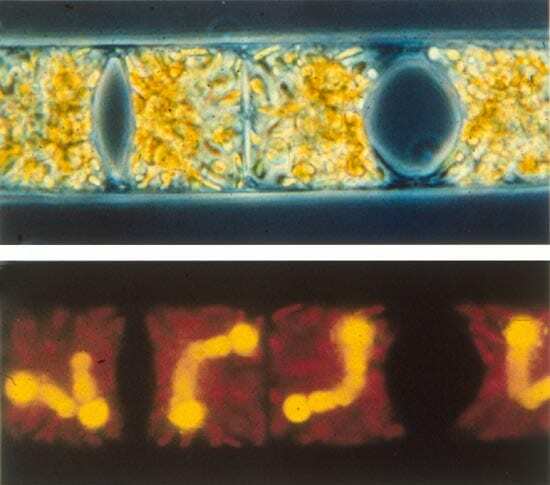 In 1977, we were using epifluorescence light microscopy to count bacteria in seawater aided by fluorescent dyes that stained bacterial nucleic acids. Synechococcus was discovered when quite by chance we examined unstained samples and were immediately struck by the numerous small cells that fluoresced bright orange (photo at right, by John Waterbury). The brilliant orange color results from the natural fluorescence of phycoerythrin, one of the phycobiliproteins abundant in cyanobacteria. In 1985, WHOI scientist Rob Olson was the first to take a new instrument, the Flow Cytometer, to sea. It exploits fluorescence to study individual cells. With it, he and Sallie Chisholm of MIT detected very small cells with natural fluorescence of their chlorophylls. 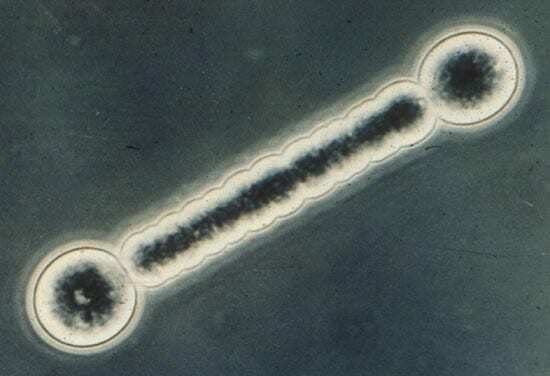 This unique “signature” led to the discovery of Prochlorococcus, which turn out to be among the most abundant organisms of Earth.